Overshadowed last week by Nagisa’s slump was the fact that Ayano still didn’t really want to play badminton. The exact reason why was not explicitly laid out until now, and it paints both her reluctance to join the bad club and Elena’s adamant insistence she join anyway. By getting to the roots of the two girls’ motivations, the episode succeeds in strengthening both characters and elevating the show’s drama. 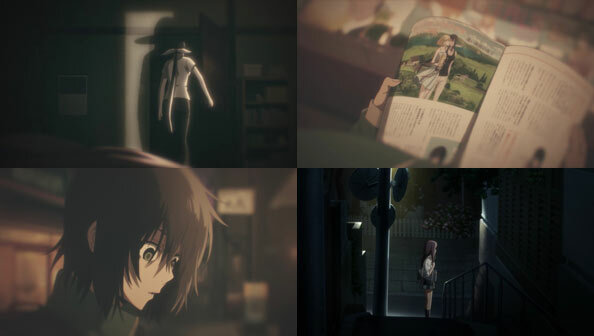 We start with a series of flashbacks from Elena’s perspective, always on the sidelines watching Ayano with a combination of awe and pride, but also loneliness, and even envy. 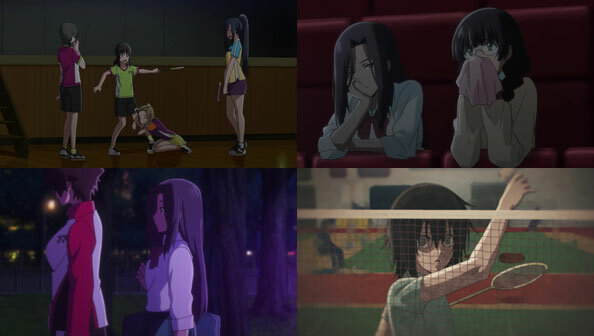 Mostly though, since they were wee girls Elena has always known how much Ayano loves badminton, and so simply couldn’t allow her to reject it. It wasn’t just about wasting talent, but denying herself that which both of them know she loves. Of course, we’ve known that love is tainted by the huge expectations others put upon her, and the unwanted attention she gets from other badminton lovers for her body and her skills. Elena watches the others fawning over Ayano, gets bored, and goes to the movies with Noriko…where she’s also bored. Afterwards, Noriko goes off on a date with Saionji, leaving Elena alone. She spots Nagisa on her run, but doesn’t call out. It’s Nagisa, on her run back, who spots Elena, who explains she wanted to see how Ayano would do on her own. Nagisa asks Elena why Ayano quit badminton, because she’s since fallen far from the “perfect” player who crushed her at the junior nationals. Elena promises to get to the bottom of it. The next day, Ayano’s personal slump is compounded by the sudden arrival of her former self-appointed rival, Serigaya Kaoruko. After nearly falling for the cool Tachibana, Kaoruko challenges a very lethargic Ayano to a set, and totally embarrasses her. This is another beautifully-animated badminton game, and it’s thrilling to see Kaoruko so easily confound, befuddle, and decimate Ayano, who had been impressing her teammates with her skills thus far. Kaoruko is disappointed, and vows that Ayano will never beat her. Considering Ayano is lying on the floor drenched in sweat, it’s hard to argue with that assessment. Ayano rushes out, and when Elena catches up to her, she says she’s quitting badminton after all; Elena can stay if she wants, but she won’t. In that moment I couldn’t help but feel bad for Elena, who had stuck with Ayano all this time only for her efforts to be impulsively discarded after just one frustrating set. It felt like Ayano was taking Elena for granted. The next day, Ayano doesn’t come to school or practice. Tachibana and Nagisa visit her house where her stately, adorable grandparents take care of her; there, they learn that Ayano’s mother was Shindo Uchika, the greatest badminton player of her generation and winner of ten straight national titles. 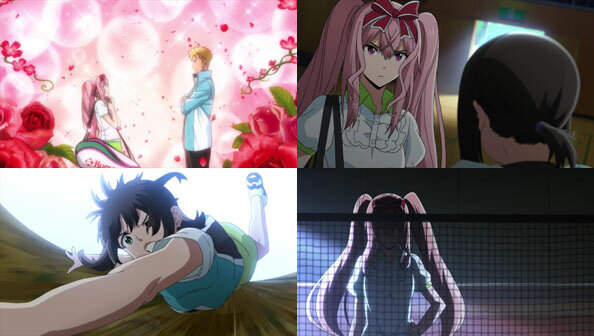 Both Elena and I considered the pressure of following in the footsteps of an almost impossibly elite parent ample motive for feeling like one’s own badminton career is pointless…but Ayano’s situation turns out to be far more fucked up. Elena may know more about Ayano than anyone, but even she didn’t understand the depths of Ayano’s pain. She also didn’t know who Kaoruko was. When the two were scheduled to have a match, Kaoruko caught a cold, so she tied Ayano up and gave her her cold so they could play “on even terms.” Kaoruko ended up beating Ayano by a hair, and Ayano passed out on the court. While still in bed recovering, her mother turned her back on her, ignored the calls of her daughter, walked out the door…and never came back. Ayano kept playing and kept winning, transforming herself into a badminton WMD, hoping that if she won enough, her mom would come back. Not only did her mother never come back, but Ayano had to learn from an article in Badminton Magazine at the konbini that her mother had taken on another student in a faraway land and trained her to be her successor. Earlier I wondered whether perhaps there was a good reason her mom had to go, but no, she was just a garbage mother and human being. 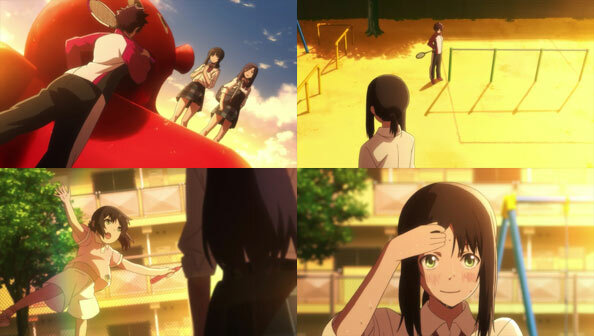 Elena ponders the shocking new information Ayano has given her on her walk home, but one image over all others continues to be prominent in her mind: that of a tiny her watching a tiny Ayano playing badminton with her mom and loving every minute of it. Elena considers it her duty as Ayano’s friend to help her get that feeling back—a feeling independent of pressure and betrayal. To do so, she elicits the help of Nagisa. Elena and Ayano meet at their usual meeting spot atop the red playground octopus. Elena tells Ayano she needs to go back to school, and Nagisa makes her appearance. Then Elena tells Ayano something she didn’t know before: How then, and now, she felt/feels “left out” when she watches Ayano play. Elena always thought she doesn’t have anything she can devote herself to, but she does. 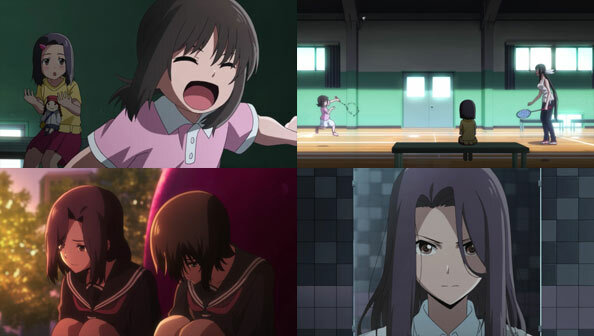 Ayano loves and devotes herself to badminton, and Elena loves and devotes herself to Ayano. Even if she feels lonely, or left out, or envious at times, it’s all worth it to see Ayano have so much fun. With that, Nagisa draws a makeshift court in the sand, and the two have a match. It’s a bit of a mess of a match, with the wind wreaking havoc on the shuttlecock…but it doesn’t matter. Ayano is able to drop the baggage surrounding the sport she loves and simply enjoy playing it again. The rest of the club is contacted and they join in the fun. And the next day, Elena and Ayano turn in their forms indicating their intention to join the Badminton Club. Ayano was dealt a terrible hand in moms, but in turn was dealt a great hand in BFsF. The entire episode is a flashback to The Great War when Huey was a lieutenant in the Royal Air Force, where he quickly distinguishes himself. It focuses on his captain, Ilas, who switches sides to the Germans. He is writing a war anthology containing the voices of the battlefield. A biblioprincess, Raziel, visits him one night to tell him it is the egg of a phantom book. He meets Huey in a dogfight, at which time Huey tells him he should be dead, and uses the anthology to defeat him. Raziel’s keykeeper – whome Ilas met earlier as a bartender – raised him from the grave to finish the book, but when he didn’t, he returned him to the afterlife. The subjects of this series have been as wide-ranging as those contained within a library, and I like that. The episodes can be enjoyed individually due to their unique and diverse characters. This week, there’s no Dalian, but another biblioprincess – the third we’ve encountered – but rather than focusing on her and her keykeeper, it’s mostly about their instrument, Ilas. This episode is also full of WWI-era bi-(and tri-)plane action, which when set against the picturesque European countryside, makes for a most impressive and bouyant setting. For Raziel’s (brief) part, she is quite nimble and light on her feet, sporting a very cool get-up. Huey and Ilas are both total Wright-nerds and adept at “basquet-ball”. They’re both aces (Huey won the Victoria Cross and gave it to his underling without a second thought), but neither consider themselves “warriors”. Ilas is more interested in crafting his poetic war anthology than killing bogies, while we all know that when the war ended, Huey moved on to solving mysteries with Dalian. It must have been strange for Huey’s CO and mentor to die, then suddenly reappear on the enemy side. A nice touch is the key to Dalian that Huey mistakes for the key to the manor – perhaps he didn’t yet know his mystical calling?